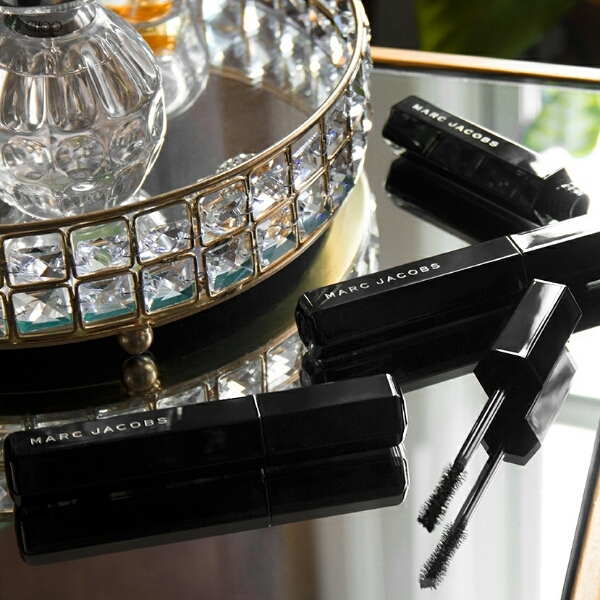 The NEW MARC JACOBS BEAUTY Velvet Noir Major Volume Mascara is a supreme, superb black, which I loved; the bold black is just as lashes should be: dark, vampy, dramatic. It’s 1990’s grunge, heightened and nurtured from ragged flannel to a luxuriously, modern velvet visage; a neo-classic retrospective of past meeting present-day noir, still rich in history and culture, and born of inspiration that begs you to be inspired as well. 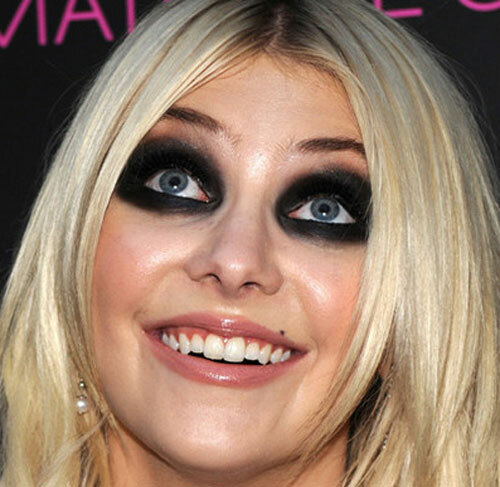 At first glance, the mascara looked thick, yet slightly wet and possibly messy. When opening it again, I wiped off the excess from the wand (as you’re supposed to with all mascaras) and all was well – no mess. It is worth noting that I am severely eyelash-challenged and wholeheartedly believe my brother inherited all the lashes assigned to our family. 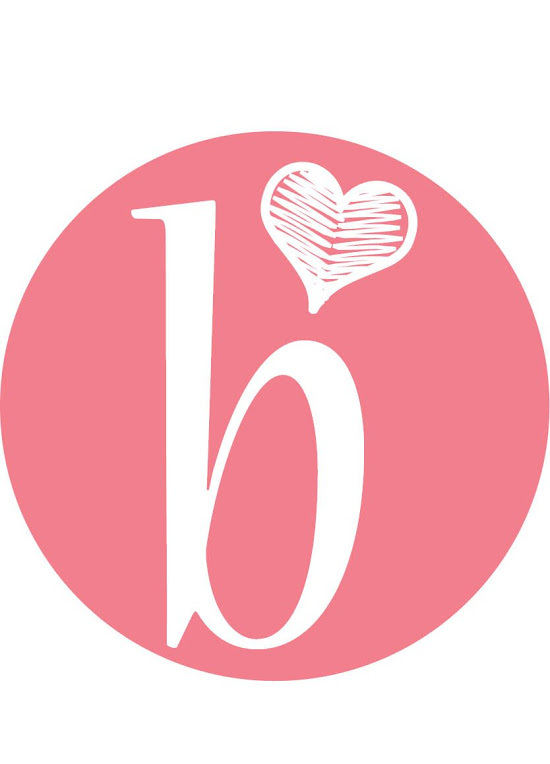 Given that, I usually, use at least 3 mascaras: one to define, one for volume and another for length and perhaps another for depth of color; all waterproof formulas. I generally dislike non-waterproof mascara, pretty intensely. Instead of enjoying your evening, if you dare laugh too hard (which I always do) or shut your eyes for the briefest of moments, you now look like an expertly groomed racoon with two black waterlines trailing down your beautifully strobbed cheeks. While Velvet Noir didn’t give me 80s raccoon eyes, it did smudge a bit; giving me a slightly smoked out eye, when I blended out the tiny baby racoon prints left by this mascara. 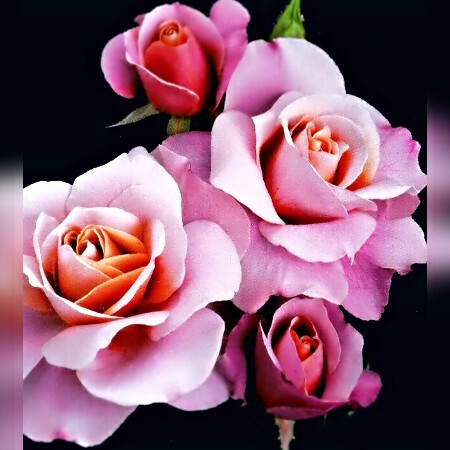 Still, it is a great product; with, again, the blackest of black color with a divine subtle scent of roses, which left me pleasantly surprised! Amazingly BLACK! I loved it, but I would have loved Velvet Noir so much more had it been waterproof. I feel my eyes are too small, so I never wear mascara on my bottom lashes; a waterproof formula would have eliminated the slight smudging problem I encountered. Velvet Noir Mascara did give me volume and length. It wasn’t clumpy for me, as other reviewers stated, but perhaps that is because I wait quite a bit between coats. For example, I’ll put on the first coat, roll up my hair and then put on the second coat, etc. 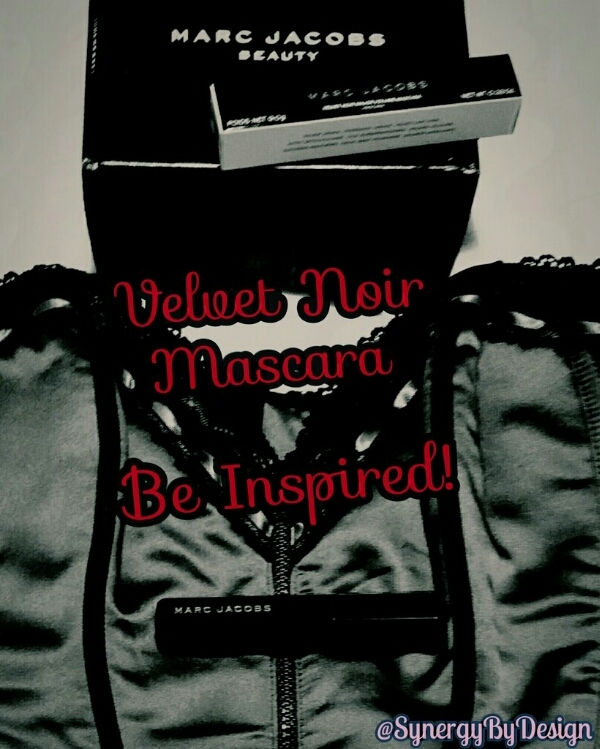 I didn’t expect much of one mascara, as I said my lashes are seriously lacking, but Marc Jacobs Beauty Velvet Noir Major Volume Mascara came through with its beautifully, dramatic black color… It is aptly named, that’s for sure! 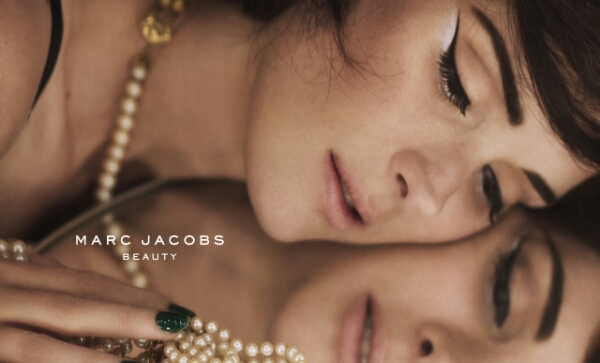 Marc Jacobs really did choose the perfect face for this campaign in Winona Ryder. 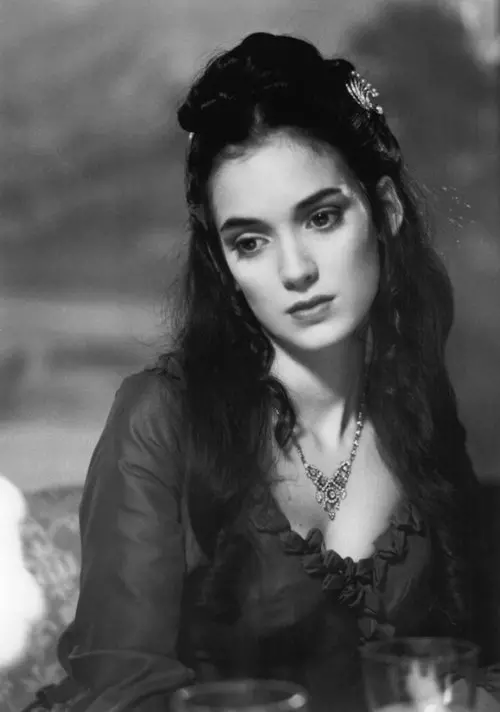 She was the face of 1990’s grunge, starting with the growing pains and heartache of “Reality Bites” to the very noir “Edward Sciccorhands” and her power-couple status with Johnny Depp. Ryder is just as beautiful now as then; if not moreso…. 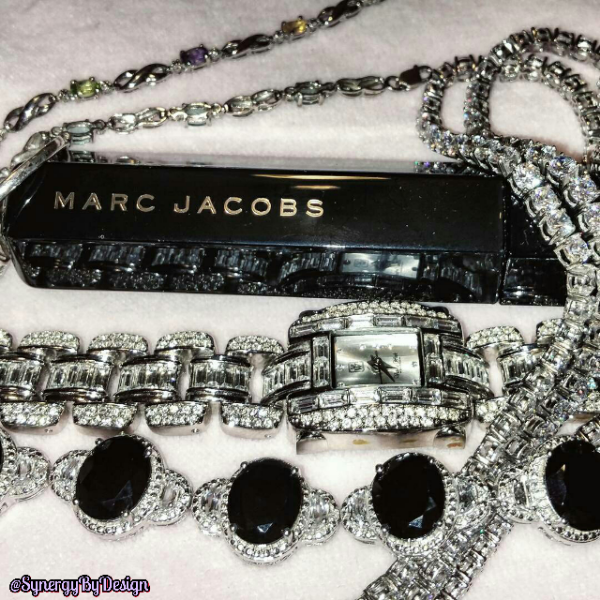 she’s grown through her experiences; and past meets the present, once again, with her collaborating with Marc Jacobs. 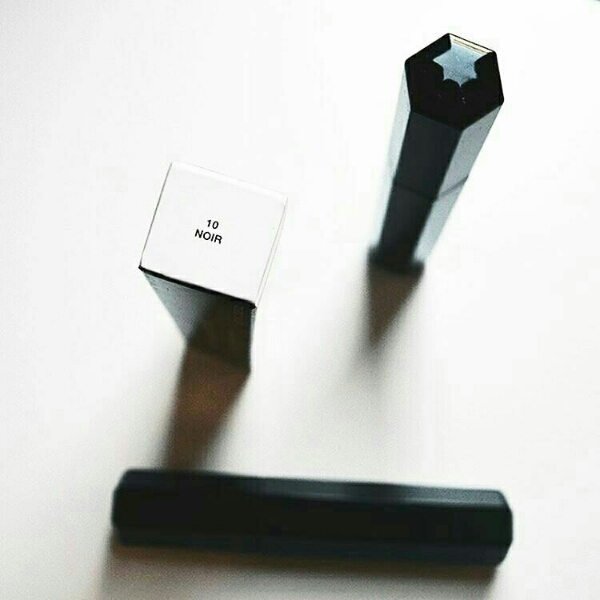 Velvet Noir is, most definitely, the blackest mascara I’ve ever seen! You could see I had lashes! No, they weren’t anything like falsies, but isn’t that the point of false eyelashes? To be somewhat exaggerated? Again, if the formula had only been waterproof… I could have put on a few more thin coats and gotten more volume and length. I’ll just have to pray it’s released in a waterproof formula at some point. I did like the brush a lot. The inverted curvature allowed me to get to the lashes that need mascara most, giving me the look of longer lashes. And Velvet Noir did give my lashes a bit of a curl, but I did hit it with a lash curler, just in case! 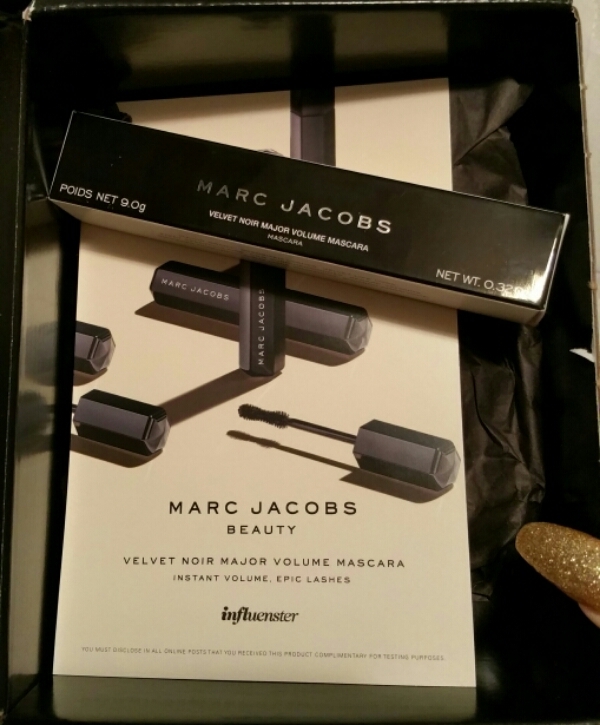 I have to mention the overall packaging is gorgeous, very luxe and I love the mascara tube! The octogon shape fits perfectly in your hand, making for a good grip as your applying. The look is very Art Deco meets Futuristic and it’s unique shape melds beauty with function very well! All in all, I give Velvet Noir 4.5 stars out of 5 stars. Now, if Marc Jacobs Beauty decides to add a waterproof formula to this line? All I ask is: Let me review it again? It will get the 5 stars it deserves. 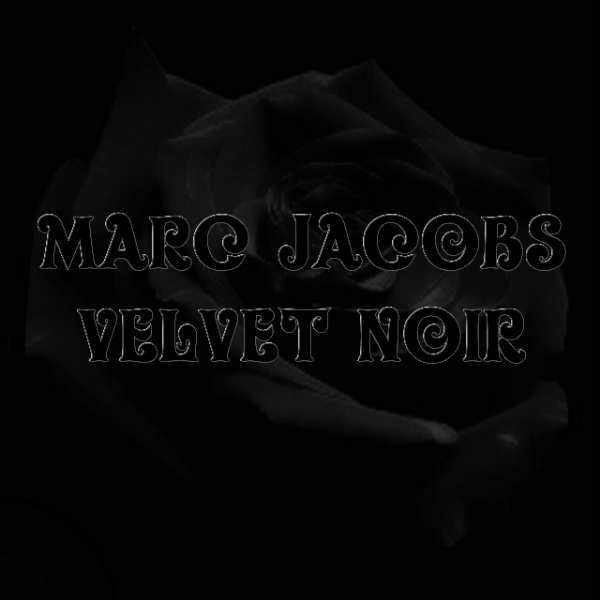 Until then, I’ll add a coat of waterproof mascara on top of Velvet Noir, but nothing will match the beautiful, dark almost-coal-black color created by Marc Jacobs for his Spring 2016 Collection. It’s quite simply Inspired. 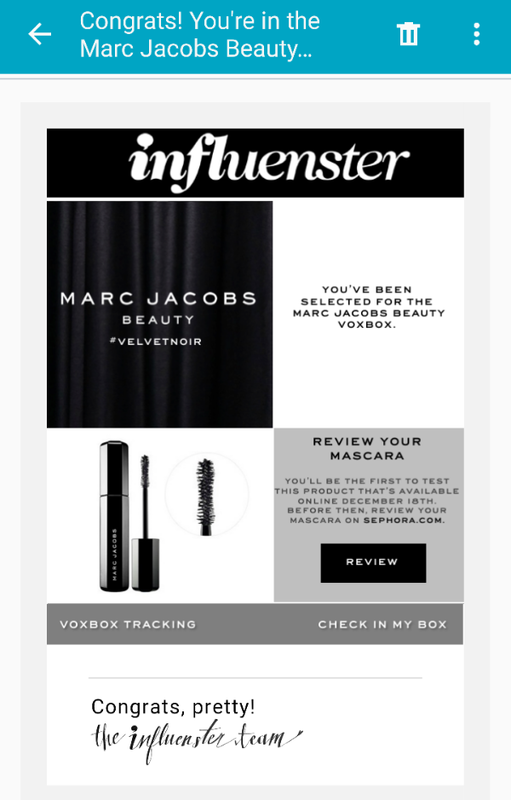 This entry was posted on Friday, January 8, 2016, in #BBlogger, #BeautyBlogger, #VelvetNoir #MarcJacobsVoxBox, 4.5 Stars, @Influenster, @InfluensterVox, @MarcBeauty @MarcJacobs @TheMarcJacobs, @SynergyByDesign, Be Inspired, Beauty, Blackest Black Ever, Brand, Contest, Cosmetics, fashion, High-end Cosmetics, Hollywood, Influenster, luxury, Makeup, Marc Jacobs Beauty, Marc Jacobs Beauty by Marc Jacobs, Marketing, Mascara, Rating, Review, Rose Scented, Roses, Social Media, Social Media Expert, Social Media Influencer, Social Media Marketing, style, Synergy, SynergyByDesign, Test Review and Rate Products, Top 1% of Social Media Users, Velvet Noir Major Volume Mascara, Voxbox and tagged blackest black I have ever seen, bold beautiful black, great color saturation, lengthening, non-waterproof, thick, defining, volumizing. 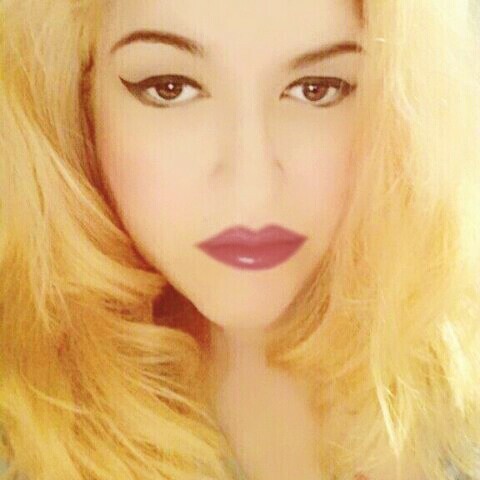 I received two Yves Saint Laurent Rouge Pur Couture Lipsticks in #9 Rose Stiletto and #19 Fuschia for testing and review from Influenster. The colors are so very beautiful; not glaring or gawdy, and neither seemed too harsh, sallow or too blue or orange, for any skin tone or complexion. They are extremely flattering colors, universally. The base color on the lipsticks make them appear almost neutral based, hard to do with any color, let alone two drastically different pinks. Rose Stiletto being a more medium dusty rose-brown; while Fuchsia is a bright pink – not shocking or neon; this isn’t your 80’s Fuschia – with a natural feel, like you would see in a garden. A succulent bright bold pink. The texture is very creamy, smooth, silky, sensuous; very moisturizing. Almost too moisturizing. And, there, lies my only problem with these lipsticks. Being so moisture-rich, the lipstick doesn’t stay in place, but rather tends to smear beyond the lipline the minute your lips touch one another. I am used to and prefer wearing matte lipsticks that stay put; I am not fond of lipsticks that travel or leave a trail anywhere: let alone everywhere. 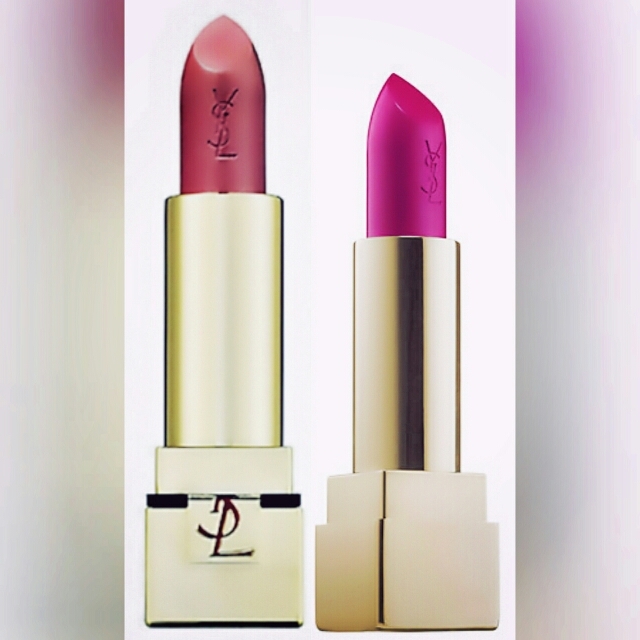 Especially everywhere around my mouth, which is something I had never experienced with my prior YSL purchases or expected to experience with these beauties, but perhaps that is because my prior YSL lippies were matte finish. I am not quite sure. I tried several different applications and techniques: with lip liner, colored and clear; lip balm, wax and long lasting formulas, lip primer and without, concealer, foundation, using a lip brush or applying directly from the bullet, blotting, the tissue and powder trick, but none of it helped keep the lipstick from smearing outside my lipline within seconds. Honestly, the lipstick is so moist from the whatever oil is infused in it for anti-aging properties that it felt very oily and too soft, smearing and disappearing fairly quickly. So I canot say I found the lipsticks to be long lasting, as others did. Although, the Fuchsia did fare a bit better than the Rose Stiletto, but not enough to call it long lasting. Therein, I did not find the formula drying in the least, as some reviewers did. In fact, were the lipstick clear it would have made an excellent lip conditioner. The colors, however, are magnificent: beautifully soft and awesomely bold. I loved all the other colors I saw on Sephora’s website as well; they really are an excellent mix of both feminine and edgy. 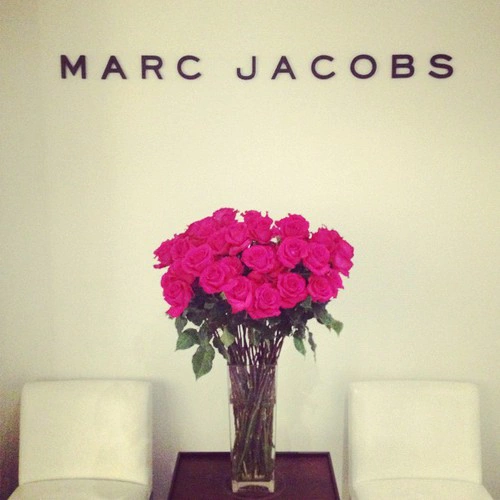 And the scent of roses from the lipstick is so heavenly; I loved it. 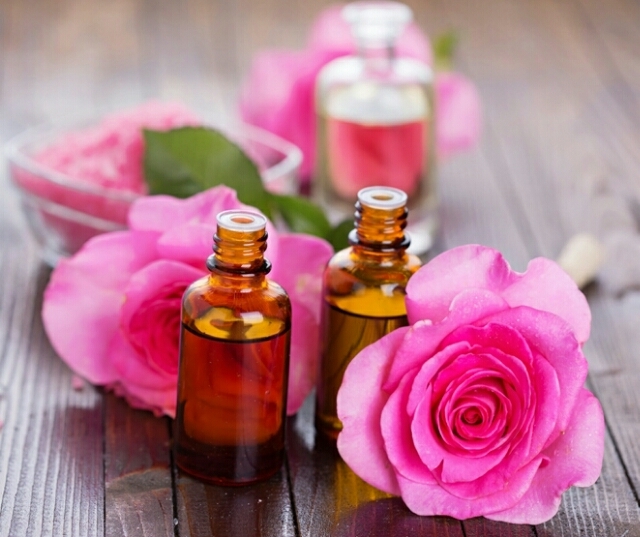 It was like a whiff of a decadent Parisienne perfumery or a floral shop filled with the most delicate blossoms; luxurious, lush, exquisite… roses. 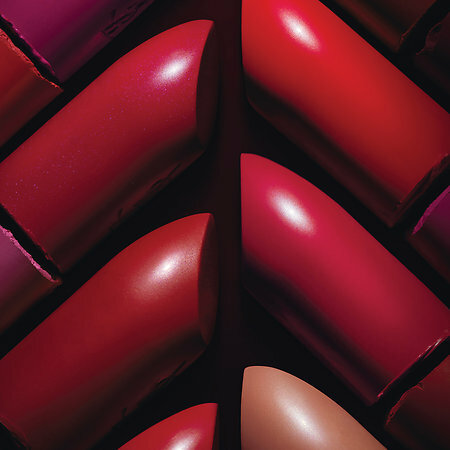 Perhaps it was just me that had the problem with the lipstick running, as I believe everything about this collection is luscious and full-bodied. 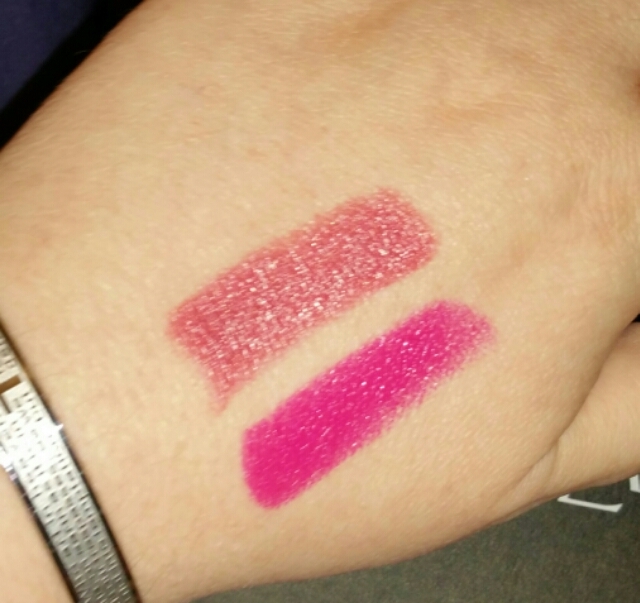 I had swatched the lipsticks on my hand when I received the #YSLVoxBox as I do when reviewing any lipstick. The swatches (pictured above) wore beautifully; lasting quite a while with a great deal of color intensity, along with being creamy, and satiny smooth. Unfortunately, everytime I tried to apply the shades to my actual lips, the lipstick melted away like butter, smearing everywhere outside my lipline. 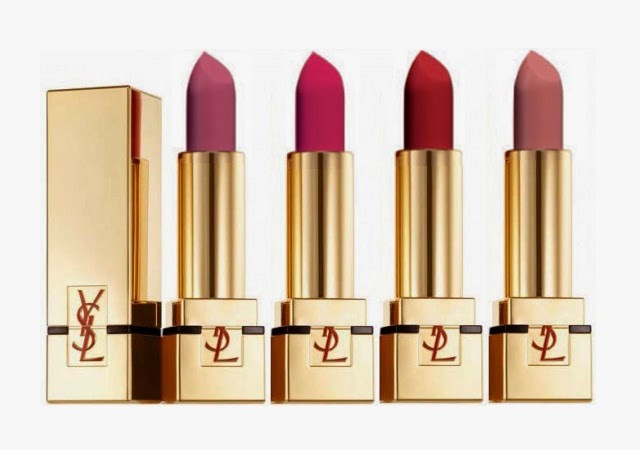 Still, given all that, it is pretty fair to say these lipsticks are beyond luxe; they are amazing. The scent, the colors, the absolutely stunning gold packaging; everything about YSL Beauty screams this is a high-end, luxury experience you won’t soon forget! I do have to disagree with some of the other reviews: these lipsticks are very emollient-rich and far from being drying to the lips, as some stated… your lips will be happily and amply moisturized. Unfortunate for me, but wonderful for so many lipstick lovers. And this really is a lipstick to love! 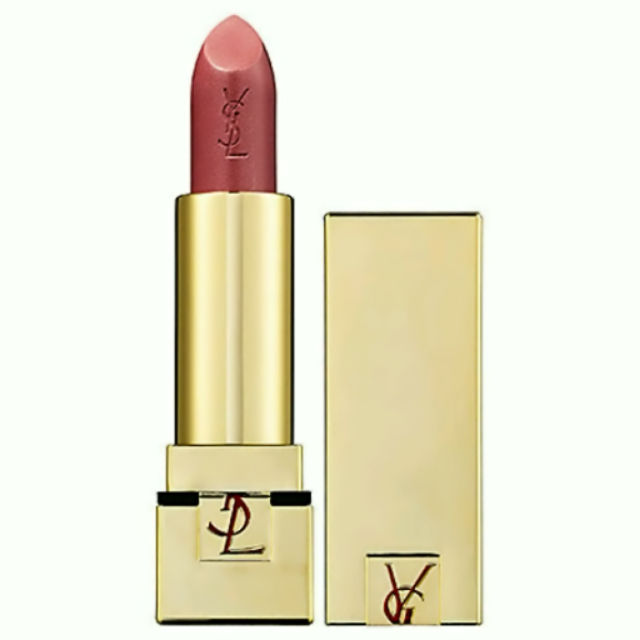 YSL Rouge Pur Couture Lipstick is a far beyond high quality collection of luscious, mouthwatering, glamorous lip colors, ranging from bold and edgy to soft and feminine, so 4 stars from me. At least, for now. 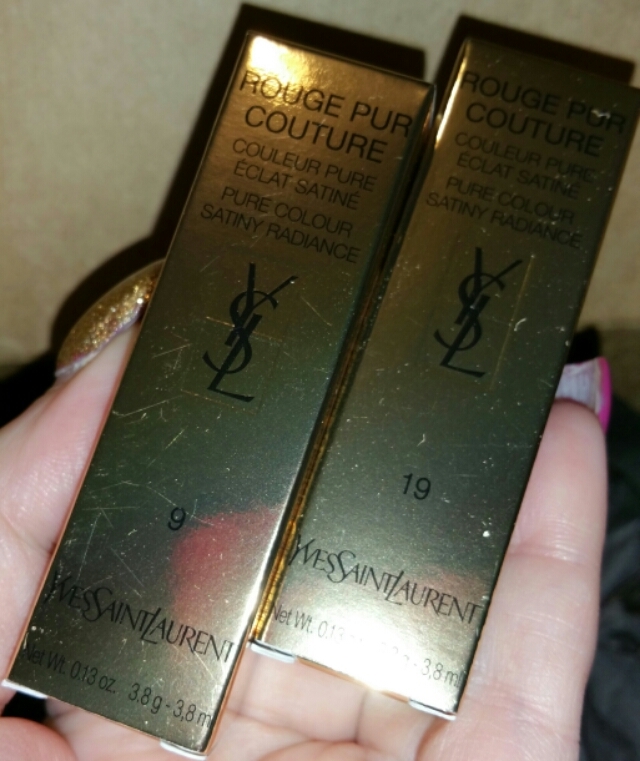 But, I am not giving up on YSL Rouge Pur Couture #9 and #19! I will keep working with these lipsticks until I get them to stay in their place and can revise this rating to a deserved 5 stars. Why? 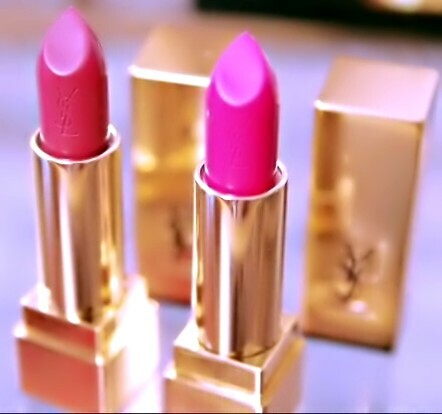 Because I love YSL Beauty. Although, I will admit that the YSL Rouge Pur Couture ‘The Mats’ Collection would have been a much, much better product fit for me. Not one to give up, I figured out how to make the lipstick stay in place. The problem was treating this lipstick like any other lipstick. And, believe me, it is not just ‘another’ lipstick. This is Luxury! Beautiful, Bold, Feminine… Seductive, Edgy, Uncompromising, Dangerous Luxury! It Wears You; It Clothes You. It Is Couture. Thus, applying the primer, foundation, concealer, lip balm, powder, etc., made the lipstick move around like crazy, causing all the smearing! 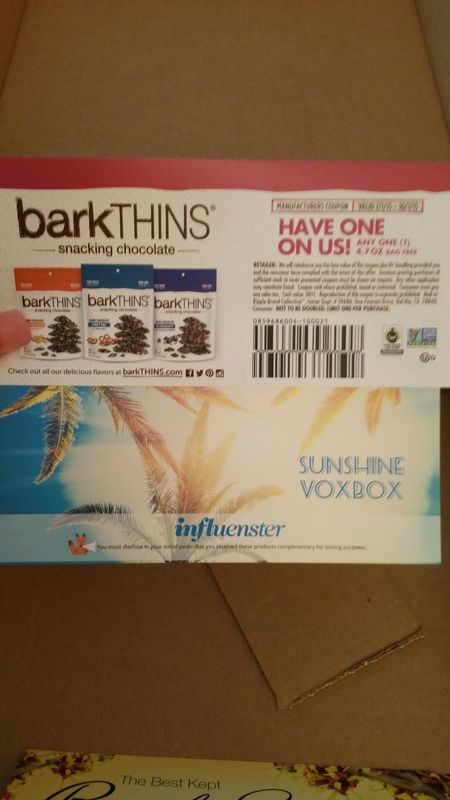 These techniques are needless, because of the quality of the ingredients in the product. 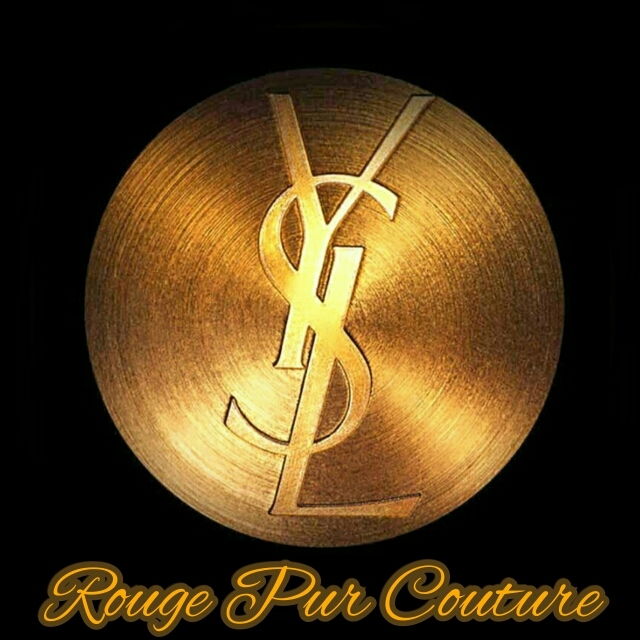 YSL Rouge Pur Couture is moisture-rich, eliminating the need for primer. It is, also, deliciously creamy and thick, eliminating the need for foundation, concealer or powder for it “to cling to” as other lip products recommend you do before application. When I went simple, just using lip liner and applying the lipstick in sections of thin layers of color; and THEN, waiting about 2-3 minutes before applying a second and third layer for depth… it made all the difference in the world. The first coat, I started by applying the lipstick to left half of my top lip, then right half of top lip and moving on to refine the cupid’s bow; then I applied the lipstick to my lower lip in brief strokes. After waiting for the color to set about 2-3 minutes, I followed with a second and third coat of color, as you would normally, starting with my bottom lip. I waited again, a brief time, before bringing my lips together to blend! Although, lipliner probably could have been skipped altogether, I really like a defined lip and prefer to use liner. I used ColourPop Cosmetics’ lippie pencil lip liners. They have a matte finish with a long-lasting formula I love. So, it is ☆5 Stars☆ from me! 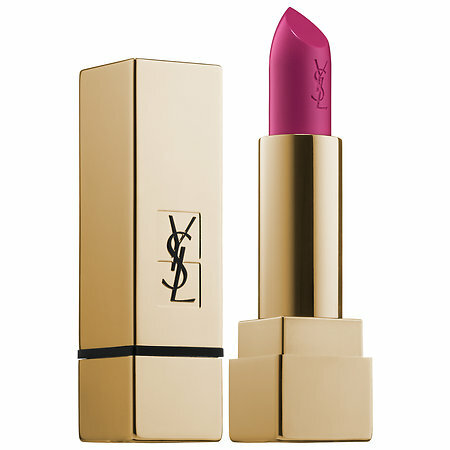 YSL Rouge Pur Couture is definitely a lipstick addict’s dream come true! If I could choose another YSL Rouge Pur Couture Lipstick to try in the future? 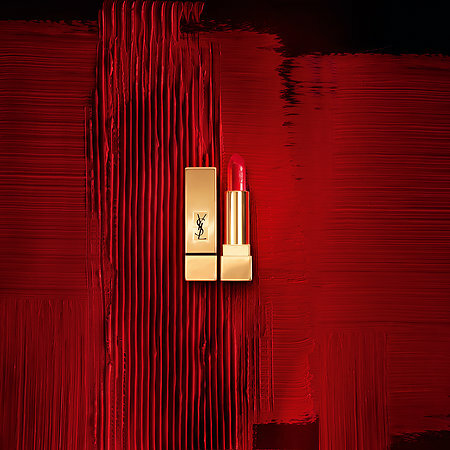 I would love to try one from YSL Rouge Pur Couture – The Mats Collection; a gorgeous deep matte red – any color between #202 Rose Crazy through #206 Grenat Satisfaction. My favorite of those? All of them, lol! 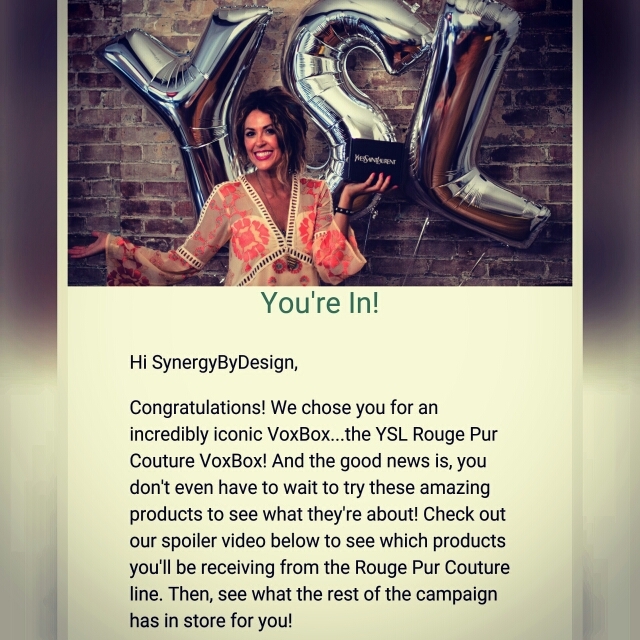 This entry was posted on Thursday, October 22, 2015, in #19 Fuschia, #9 Rose Stiletto, #BBlogger, #BeautyBlogger, 4 Stars, 5 Stars, @Influenster, @InfluensterVox, @SynergyByDesign, @YSL, @YSLBeauty, @YSL_PR_GIRL, All Categories of Products for Review, Beauty, Beauty Icon, Brand, Bright Hot Pink, Color, Contest, Cosmetics, Dress Your Lips, Dusty Rose-Brown, Free Boxes of Products for Honest Reviews, glam, Haute Couture, High-end Cosmetics, High-End Fashion, Influenster, Lipstick, Love, luxury, Makeup, Marketing, Photographs, Pictures, Rating, Rating Updated, Review, Review Update, Rose Scented, Roses, Rouge Pur Couture Lipstick Collection, Samples, Social Media, Social Media Expert, Social Media Influencer, Social Media Marketing, Social Networks, Synergy, SynergyByDesign, target marketing, Test Review and Rate Products, Top 1% of Social Media Users, Update, Voxbox, YSL, YSL Rouge Pur Couture, YSLVoxBox.